Making a New Sound Post. I recently bought a new Eastman violin which I love very much and I am using to practice and learn on and I am very happpy with. 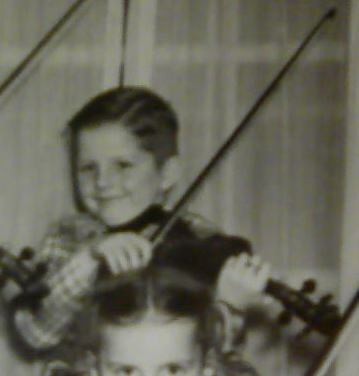 But, I also still have my old violin that I learned on when I was a kid. My parents bought it for me back around 1967 when i was in grade school and was taking lessons at school and playing in the school orchestra. Over the years the old fiddle fell into disrepair. The sound post fell out and was lost, the nut and fingerboard fell off and the nut was lost. Recently I decided it would be nice to restore the old violin as there are many old memories attached. So I ordered some materials from a Luthier. I ordered some hide glue which I used to reattach the fingerboard and that repair came out very nice. I bought a new nut and carved it to fit and glued it in place. Now the hard part. I bought some stock soundpost material and a sound post setter. But man oh man... am I having a heck of a time trying to carve and fit a new post. I am trying to shape it to the proper curvature and fit between the top and bottom. Perhaps I should have bought a sound post measuring tool as well, or perhaps I can make one. Or, maybe I should just have a luthier do it for me. Has anyone out here managed to successfully carve and fit a sound post ? Or would I best leave this to the experts who do this as their profession ? Is this generally an expensive repair ? Once the sound post it in the rest is easy. New bridge, new strings, new tailpiece, new chin rest and viola' the old fiddle will live again. And the memories attached to this violin. Getting yelled at by my teacher, playing in the orchestra on concert night, trudging with it to and from school in the snow, rain, hot and cold. Patience is the key to fitting a sound post. Have you looked at any online tutorials? Using the post setter is the hardest part - tie a string on it so you can retrieve it easily when it falls (or when you take it down to try again.) Perfect fit is well worth the time it takes to get it right - it is the "soul" of the violin, after all. Thank you. The way I see it the more I learn about violin repair the better. I would even like to learn to build a violin. I looked at a tutorial on http://www.violins.ca which explains the basics behind cutting and fitting the post.. I like your idea of using a string to retreive the post. Part of the headache was struggling to shake the sound post through the F holes each time it fell. The string idea should help. I'll give it a try and keep everyone posted (no pun intended) as to how it works out. OK, as some of you know, I did a complete repair to my old fiddle, taking it to a luthier some 30 miles away who "took me under his wing" so to speak and instructed me on sev eral things about a repair and setup job. I made my post from a birch dowel about 8 mm in dia by turning it down with sandpaper and a drill.. When I got to 5.5 mm (That would fit thru my F hole easy) I made sure it was flat on the ends and by off center sanding a touch to get the final dimension I was able to see which side was the longest and made a mark to know where it was when inside the violin. I used sewing thread, just make a light hitch around the post about 3/8" down from the top. Insert the thread into the violin and snag one piece of it thru one F hole and the other piece thru the other f hole. Now, do a little multi-tasking with one hand and by manipulating the two threads you can make the post dance in a semi upright position and with the other hand holding the post setting tool, you can position the bottom of the post using the threads, and then pull it up tight with the tool. When done, just pull lightly tug if necessary repeatedly and the thread will come off clean. Measuring for one is tricky, without the old one, mine was a touch over 51mm. Might be a good place to start from if yours is a 4/4 unit. ...or, spring for the measuring tool or make one. OKay here are some tricks to make this easier. A measurind tool an be made from a metal coat hanger. Take a look at how they are made and bend up two pieces of coat hanger to match that shape making sure that the handle part id inline with the measuring part. This way you can see the position from oustdide the violin. After bending the two pieces together just wrap some wire around the two so they stay together. Put it into the violin in the right position and having your hot glue gun ready put a drop of hot glue on the measurer so it stays at that measurement. Now you have the length. To get the angle is much simpler. People try to measure the angle from inside but the angle from the outside is the same so take your soundpost and cut it a little long then put it on top in the position you want and sand it until the angle is correct and the post is straight up. Use a pencil and mark the post for the top and which side faces the side of the violin. Turn the post over and do the same on the back keeping the post facing in the same dirrection and sand the angle until it is both correct and the post is the correct length. Now the real trick putting it in without a soundpost setter. Get yourself a flex straw. the kind you drink from that has the bend thing in it. passt a string through the straw and then back again making a loop at one end and two loose ends at the other. put the soundpost through the loop and pull the strings taught. Now you can bend the staw and insert the sound post and straw into the violin get it into postion then just release the tension on the string and pull out the straw and the string leaving the post with no string on it. You could use small copper tubing or who know what in place of the straw but it makes it fast and easy. Good luck and let us know if this helps. Nice tips, Kevin! The straw would ensure that you didn't leave any scratch marks at the FF hole, too! Thanks to everyone who responded for some great tips in getting this job done. I'll try some of the helpful suggestions and see how it turns out. It would be nice to get the old violin back into playable condition again. Here's a video I did that shows a frequency spectrum analyzer used to obtain the proper placement of your post. I tried to obtain the flattest spikes across the whole freq range. When you watch the video you'll see what I mean. Today I decided I wasn't totally happy with the spot or the post so I took it out and hit a couple strokes on the sandpaper block and then reset it in a different spot. I did that last part about 5 times, using the spectrum analyzer to decide if I should leave it alone or try again... and the last time I was totally happy and delighted with the sound. It's almost a reverb type quality about it. Before I was totally happy with only the sound and tone of the E and A strings but the lower frequencies just weren't getting out... then after the last adjustment I said, hey dummy, you should've did a video so at least I got the end of it. You don't need to see what it "isn't" supposed to sound or look like, just what a good sound shows up as on the screen. Wow Dennis, You've learned so much in such a short period of time. I love the way it sounds like Star Trek when you hit the functions. Great post, can I send you a recording of my 2 violins for a comparison or do you have to connect to the instrument in some way. Found one called ianalyse. The lite version is free and gives you a 3D block diagram of your recording. The other, pucker varieties go from£40 to £70 per App ($60-$100! For an iPhone app, Jeez!!!! It's just an app for the phone, no electrical connection at all. That's why it's so neat to use. Pick up the violin and play it normally and see how the various peaks align. If you're heavy in one place more than another, then adjust the post slightly and try again. Trial and error will get you dialed in. I also have the post trimmed until it's loose without strings to hold the tension. That was the biggest thing that made such a difference in sound. The spectrum analyzer can hear sounds you can't and thus you can use your eyes to get the best sound and be able to "see it". I think you were joking but just in case you weren't, here's why a spectrum analyzer on the Internet wouldn't work. Feedback... The microphones on peoples computer systems are pretty varied, and their phones are sitting right there without delay, or connection issues or transmission issues. free version is not too hot! my first recording lastest 20 seconds, after that you only get 10 seconds. Maybe the full version is better. here's an example of the "off-post" recording. to get a comparison I would have to do 2 seperate recordings and play them side by side. But then, that wouldn't still tell me the optimum position for the bad soundpost. wow, that thing is pretty complex, almost too much and too fast on the display. You can see though the mid and high freq response of what you make the sound with are totally different in amplitude. Try bowing when you make recording on open strings. C'mon people, I think this whole business of "Spectrum Analizers", is getting a bit too technical. People are downloading special software just to move a sound post. I think the business of learning to play the violin is what "Fiddlerman" website is all about, not relocating sound posts and such, that's the job for an experienced Luthier. Folks are gonna be moving sound posts all around the inside of their instruments and then losing them inside the violin, maybe they can retrieve them, maybe they can't and end up taking them to a Luthier to be reset. The business at hand here in this site is to learn to play, Learn to play Twinkle, Twinkle , and a few other songs proficiently, then worry about the quality of sound. I called my Luthier before I posted and asked him if he used a Spec. Analizer, he just chuckled and said no and he doesn't know of a Luthier who does, he just uses his ears. I'm not possitive about this, but I don't think "Stradivarius" used any sophisticated equiptment when he made his violin's. There are too many beginning players that i've seen on video's who can't hear when they play a note off key. Those are my thoughts and opinion's, for what they're worth, which is probably not much, but that's just me. Keep practiceing and the better you become at playing, the better the sound from your violin will be. <<< EEEK.... <<<< mmmmm, how sweet it sounds now. 1 Have you adopted a spectral criteria for a preferred sound post location ? What should the individual note spectra look like ? 2 I am assuming that your signal transducer is a microphone ? 3 I believe that the standard sound post location is 3 mm behind the bridge. Are you finding that to be true ? IMHO I think the location of a sound post by frequency response is a great idea if one is set up for that and I would expect that such a systematic approach would far exceed the accuracy of a human operator. ...as you might guess this is just for curiosity mostly but I think if Antonius had one, he would've used one. I wonder how many luthiers who turn there nose up at using one, have even considered the scientific aspect of post placement and whether their ear was as good as using a tool to get close in a short amount of time and then fine tuning that location after achieving decent results. Can you do it without technical equipt...(?) well of course. and like you said, scientific equipment is far more accurate than the human ear in general. I have no preconceived notion of what is and what isn't a good readout on the analyzer but in MY situation, achieving a flat across the top series of peaks from as low as I could see to as high as I could see made the nicest sound. Lacking any scientific or testing to prove otherwise, I'm happy with that. The signal transducer is a simple cell phone microphone of an android phone. Not some sophisticated laboratory device worth thousands and this test was in my living room with many other device running at the same time (e.g. fan on the fireplace, computers, the TV/Stereo turned down low, etc.) so it was hardly the holy grail of discovery. LOL It was for fun and to peak peoples interest in the subject. I don't know what the accepted location is from the "experts", but my expert whom I work for part time working on violins now, has actually voiced an interest in me using this little 'novelty' to 'see' the sound from other violins in his shop that are there for new strings, peg work, etc. I find his interest refreshing rather than turning a deaf ear to technology. The location I have ended up with is about 6-7mm behind the bridge foot and almost directly behind the bridge. (I have set a half-dozen posts and reamed peg holes and pegs and made 4-5 bridges since I have been there) ...and under his watchful eye, he made the remark... "you are a natural at this". I originally set the post 'somewhere', when I first put it in (it was a tiny bit tight) and from the sound I achieved, only the E and A strings really had any voice to them. The others were muffled a touch and as such I was disappointed in the result of my hard efforts to bring this violin back to life. I sat at the bench and tuned it numerous times trying to change the bridge position forward and back and get that perfect sound from all 4 strings. No luck. I chatted with a fellow named Neil Ertz who makes violins in Scotland and we discussed the "tightness" of a post inside an instrument. I then proceeded to copy his instructions to make it loose enough that even a slight tap to the side would dislodge the post without a string or two holding the bridge up. I was amazed at the result.. the first time I trimmed off about .2 mm in total length, worked on the angles a bit and then after careful placement re-tuned and played the thing. Each time I moved it a little further back away from the fingerboard the sound began to improve. I started about 1 post dia from the ff hole notches and moved it about 1/2 post dia each time. Now I'm about a full post dia or a touch more back from the ff hole notches and I'm not touching it! It's perfect sounding in all strings. They jumped to life when I moved the bridge up even with the notches and left the post away. The sound projected instantly and even the low freq of the G string were vibrating the body like nothin' I had held nor heard before. It felt almost the same as the $20K violin I briefly played in his shop. Is mine worth $20K, hell no... but the feeling it makes when played is very similar. Consider this a scientific fun experiment in acoustics to better understand how the strings make sound...good sound that your ear likes, that's all. It isn't all that hard to place one and if anyone thinks professional players all wait to get their posts moved by some 'professional luthier', well think again. Many players and some very famous ones move their own and many do it far more than they should. Once you have achieved the perfect spot, leave it alone and enjoy it is my opinion. It isn't rocket science... it's a lot of luck and a little skill.